Quick Release Bicycles was founded in March 2013 by Josh Spencer. Born and raised in Chambersburg, Josh's passion for cycling began around age 14. He was involved with Appalachian Bicycle Company, Chambersburg's local bicycle shop in the 1990's. 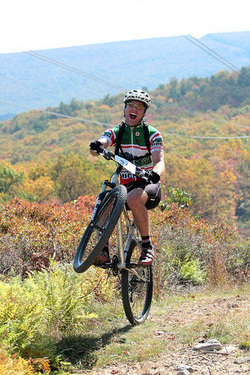 He raced for Appalachian Bicycle Company and competed in the Michaux Series and West Virginia Mountain Bike Series. After joining the Army and being stationed in El Paso, Texas, Josh experienced mountain biking in the west in Texas, New Mexico, and Arizona. Josh's most memorable cycling experience was having the opportunity to ride in Moab, Utah while living in Omaha, Nebraska. He's also experienced riding in the mountains of Colorado. Also while in Omaha, Josh worked for two local bike shops, The Bike Way and the Trek Store of Omaha as a mechanic. As Josh's passion for riding and knowledge of cycling grew, Josh began dreaming up what is now Quick Release Bicycles. After moving back to Chambersburg in 2009 Josh became involved with the local mountain biking club, Mountain Bikers of Michaux. Josh was president of MBM for two years and continues to support the club as an active member. Josh is looking forwarding to working with riders of all ages and ability levels at Quick Release Bicycles.